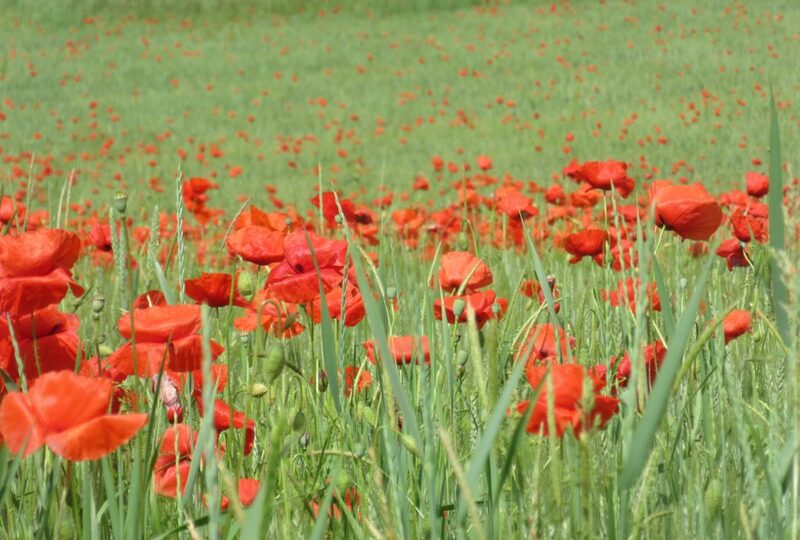 You can plan your routes using the Club Alpino Italiano footpath map or better still Hiking in Tuscany, showing footpaths around and about Caprese Michelangelo. If you cancel the altitude graph and enlarge, you get a clearer picture of the terrain. Tuscany’s rolling hills, distant peaks, cypress avenues, olive groves and sweet chestnut forests form the landscape around Caprese Michelangelo. It becomes gradually wilder as you climb toward the sanctuary of La Verna and the mountain basin of the dramatic Casentino National Park. Villa Simonicchi lies halfway between the two. There are many trails around Villa Simonicchi. It lies on the route of the Appenine Excursion. This is an opportunity to hire mountain bikes, get into the countryside away from the traffic and explore the great network of tracks. If you are a road race enthusiast you can train for ten months of the year on the hill climbs Pantani used. There are short, long, hilly, mountain spins and up to 4,000 m of climb a day if wanted. 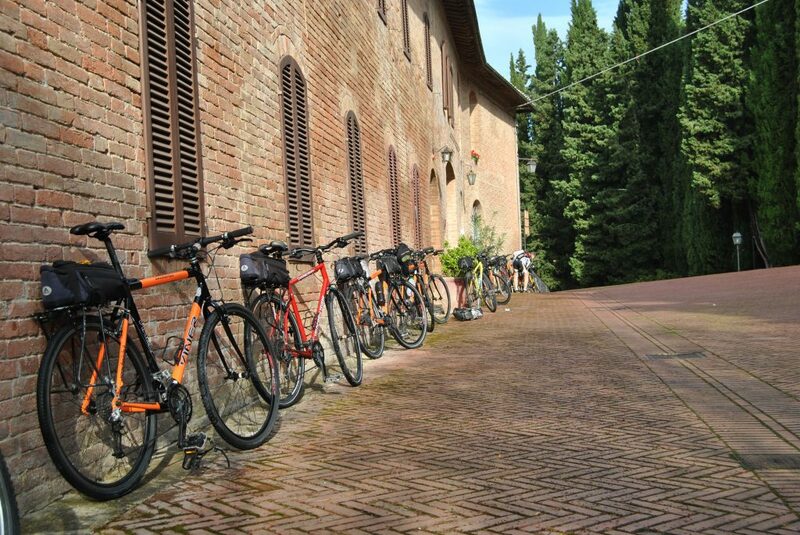 For groups of up to 8 cyclists accommodation in Villa Simonicchi costs € 30/35 euros pp. per night depending on size of group. Meals are available on request the first and last evenings. Racing during the April-September season is available for full BCF Racing Licence holders only. There are medium/high quality road bikes for hire locally – e.g. Bianchi Via Nirone C2C Alu/carbon. For pure enjoyment see the 2013 L’Intrepida, the vintage bike race that leaves from nearby Anghiari. It’s Italianissimo! Entry is open now for the race on the 19th and 20th of October 2018. L’Eremo della Casella is a stone lodge and chapel on the flat ridge of Mt. Sovaggio. It marks the spot where St. Francis spent the first night of his final journey to Assisi. There you can rest on stone beds, grill your supper over a wood fire and look out in the morning across the mountain-tops to the sea, and connected monasteries and religious houses to refuges and castles. Simonicchi to L’Eremo Leave Simonicchi on the SP 54 road and bear left at Muggibiano on footpath 039 . Continue climbing on path 039 until you reach the top, meeting trail no. 50 from La Verna. Bear left along the flat mountain ridge on no. 50, passing path no.079 on your left. 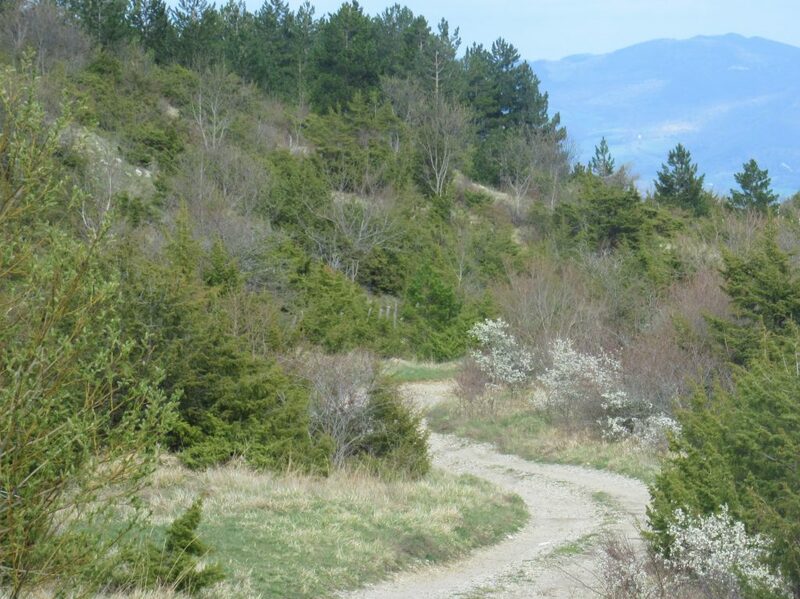 You will reach the panoramic point looking over Tuscany and La Marche towards the Adriatic. Here you find L’Eremo. Return the way you came, but this time turn right on the 079 through the chestnut forests, passing Tramoscano and continuing to Vestebbia.